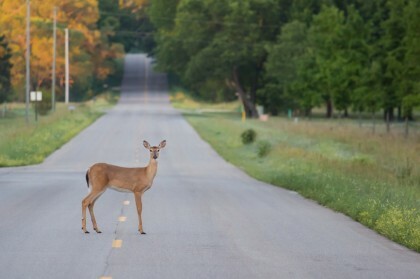 The number of reported car accidents involving wildlife increased by more than 42 percent, jumping up from 626 such accidents in 2004 to 1,087 car accidents involving wildlife in 2010. The number of people hurt in car accidents involving wildlife increased from 270 in 2004 to 418 in 2013, marking a 55 percent spike. Motorists have the greatest risk of being in car accidents involving wildlife in Lane County, particularly when driving at night. Most traffic accidents involving deer in Oregon occur during October and November. Over the past decade, the number of car accidents involving wildlife in Oregon has reportedly increased by more than 40 percent. While the statistics clearly indicated a spike in the incidence of car accidents involving wildlife in Oregon, researchers and regulators alike are now focusing on figuring out why this surge has happened and what may be done to get the number of these types of collisions back on the decline. One contributing factor to the spike in car accidents involving wildlife can be attributed to the way in with the Oregon Department of Transportation (ODOT) has changed its methods of counting these accidents. In fact, within the past few years, ODOT started including nonfatal crash reports regarding these accidents in the total count of them. Even with these changes in how ODOT records car accidents involving wildlife, there still has been a steady increase in these types of motor vehicle collisions over the past decade or so. While there may simply be more drivers on Oregon’s roads, another possible cause of the increase in these accidents is the surge in motorists using their cellphones while driving. As regulators and researchers work on trying to reduce the incidence of car accidents involving wildlife in Oregon, motorists are encouraged to put down their cellphones and focus on the task of driving so that they are ready to respond if any wildlife comes out in front of their vehicles. Have you been hurt in a car accident that may have been caused by negligence or recklessness? If so, the Portland car accident attorneys at the Savage Law Firm are here for you. For more than three decades, our dedicated and experienced attorneys have been devoted to providing each of our clients with personal attention, respect and the highest quality legal services. In fact, one of our primary goals is helping injured people recover from the financial setbacks caused by motor vehicle accidents. To learn more about our legal services and what we can do for you, set up a free initial consult with us today by calling 503-222-0200 (in Portland) or 206-957-7272 (in Seattle). You can also email us using the form on this page.